Using and Understanding Mathematics: A Quantitative Reasoning Approach increases students‘ mathematical literacy so that they better understand the mathematics used in their daily lives. 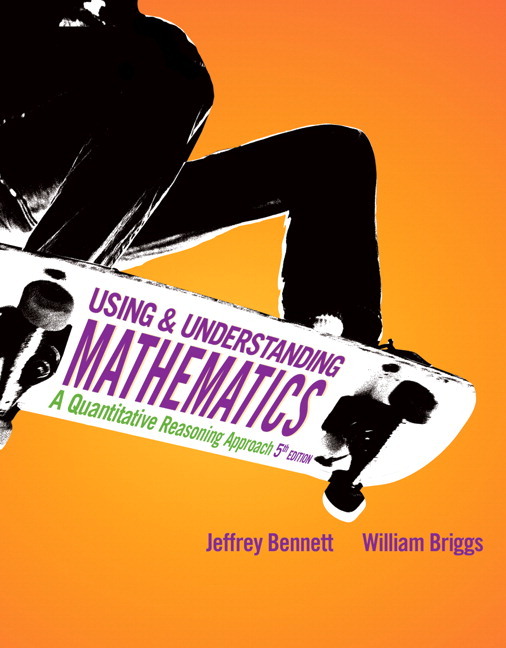 Ideal for courses that emphasize quantitative reasoning, Bennett and Briggs prepare students to use math effectively to make better decisions throughout their lives. Contents are organized with that in mind, with engaging coverage in sections like Taking Control of Your Finances, Dividing the Political Pie, and a full chapter about Mathematics and the Arts. This Fifth Edition offers new hands-on Activities for use with students in class, new ways for students to check their understanding through Quick Quizzes, and a new question type in MyMathLab that applies math to recent events in the news. In addition, the authors increase their coverage of consumer math, and provide a stronger emphasis on technology through new Using Technology features and exercises. The new Insider's Guide provides instructors with tips and ideas for effective use of the text in teaching the course. The real-world focus turns students’ attention to the math they will need for their daily lives, and keeps them engaged during the course. The table of contents is organized by real-world context, not by mathematical content. Interesting, applicable coverage appears throughout, like Unit 4A: Taking Control of Your Finances, Chapter 11: Mathematics and the Arts, and Unit 12D: Dividing the Political Pie. The modular organization makes the text flexible, allowing instructors to teach the topics they want to teach. Chapters are divided into self-contained units that can be rearranged if desired. NEW! A hands-on Activity begins each chapter so that students are engaged from page one. Activities ask students to step through practical applications of the math, for example, using dice to simulate the chances of spreading disease in a population. Using Technology boxes demonstrate how to use a graphing calculator, Excel®, or other software when applying math concepts. For example, students use their calculators to build a savings plan and see its effect over time. Practical Matters focus on common-sense applications and daily occurrences when math is applied, such as avoiding credit card trouble and spotting a bad cell phone deal. Notes in the margin–By the Way, Historical Notes, and Take Note–appear beside key concepts to show their relevance to aspects of daily life and additional mathematical detail. A Brief Review summarizes key mathematical skills that students should have learned previously. These appear wherever a particular skill is first needed, with exercises based on the review boxes can be found at the end of the unit. These can be skipped if students already have a firm grasp of the requisite skill. Now Try exercise references appear at the end of every example and direct students to a specific exercise, immediately testing their comprehension of the material. Time Out to Think appears throughout the book and poses short conceptual questions designed to help students reflect on important new ideas. These also serve as excellent starting points for classroom discussions. Thinking About features build on the main narrative and are designed to encourage a deeper level of mathematical understanding. Examples include the proof of the Pythagorean Theorem and Zeno's paradox. Quick Quizzes appear before the problem sets, offering ten questions for students to briefly check their understanding of the unit’s concepts before attempting the homework. Does It Make Sense? questions are qualitative exercise questions that test conceptual understanding by asking whether given statements are sensible, and then asking students to explain why or why not. Basic Skills and Concepts cover concepts from the unit and provide exercises that can be used for homework assignments or for self-study. Answers to most odd-numbered exercises appear in the back of the book. Web Projects require students to search for data or other information online. These can be used for extended projects, discussions, group activities, or essays. Using Technology exercises provide students an opportunity to practice skills with a graphing calculator, Excel®, or other software they might normally use. In Your World exercises challenge students to find examples of unit concepts in the news or in their daily lives. These questions may be assigned as homework or used for class discussions. Applications Exercises include updated current data for increased relevance for students. Art Annotations enhance the figures, improving their effectiveness as learning tools. MyMathLab® provides students with a personalized interactive learning environment, where they can learn at their own pace and gain immediate feedback and help. MyMathLab engages students in active learning–it’s modular, self-paced, accessible anywhere with Web access, and adaptable to each student’s learning style. In addition, MyMathLab provides instructors with a rich and flexible set of text-specific resources, including course management tools, to support online, hybrid, or traditional courses. MyMathLab is available to qualified adopters. For more information, visit our website at www.mymathlab.com or contact your Pearson representative. A hands-on activity now begins each chapter, encouraging students to engage with math in a meaningful way, for example, using dice to simulate the chances of spreading disease in a population. A full online Activity Manual now appears in MyMathLab, for those who wish to do more activities in the course. The contents of the Activity Manual are correlated to the textbook, making them easier to assign. Using Technology boxes include content from Using Your Calculator boxes in the previous edition as well as new information on Excel®, graphing calculators, and other interesting technology applications and software programs. Using Technology exercises have been added to select units and include questions that use Excel, calculators, or other technology applications. Approximately 30% of the exercises are new or updated. Select examples are now displayed in two columns, so that multi-step problems can be stepped out for students in a way that helps them learn how to solve the problem type. New content has been added to Chapter 4, Managing Your Money. This includes new coverage of stocks, bonds, taxes, credit card interest, payday loans, and sub-prime mortgages. Quick Quizzes now end each unit to test students’ conceptual understanding before they begin the exercises. These multiple choice questions are designed to be answered with an explanation on why a particular answer was selected, and will help students prepare for the rest of the exercise set. Answers are included in the text so students can check their answers. Insider’s Guide is written by instructors, for instructors. With teaching ideas, sample syllabi, tips for student success in each chapter, this guide will be invaluable for both new and experienced instructors who want to enliven their course. A new problem type presents an excerpt from a current news article or video clip and asks students to apply math concepts to a real-world situation. Live RSS feeds from news sources such as ABC News are available in MyMathLab for the new edition, so that instructors and students have access to regular news updates. These articles can be used in class discussions and projects as appropriate. Increased exercise coverage in MathXL and MyMathLab gives students more problems to practice the skills. The Image library contains all art from the text for instructors to use in their own presentations and handouts.